It’s Friday, the temperatures are climbing and we’re well into patio season. While an icy cold beer or a glass of wine are always appropriate I’ve put together a list of 5 cocktails that are perfect for your next evening on the patio or summer barbecue. SANGRIA! 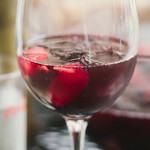 – I first had sangria on a patio in Spain over 20 years ago and it’s been my favourite summer patio cocktail ever since. Emeril has a great recipe for classic sangria and you can change it up by using a nice crisp white wine or even try it with a fruity strawberry wine. Strawberry Basil Margarita – What could be better than warm summer afternoon, good friends and a large pitcher of Strawberry Basil Margaritas on the patio? Answer: nothing! We mix up Strawberry Basil Margaritas all summer. Classic Margarita – cool and classic the margarita sets the bar for other summer cocktails. The Perfect Storm – a spicy take on the classic Dark & Stormy cocktail The Perfect Storm takes you to Caribbean with it’s spiced rum, ginger beer and lemon flavours.